Susan Seaforth Hayes has been a working actress nearly her entire life. She made her theatrical debut at the tender age of 4 playing Trouble to Dorothy Kirsten‘s Madame Butterfly. When not even a teenager, she toured with Billie Burke (known to all as the Good Witch on The Wizard of Oz) in the play Mother Was a Bachelor. Then she cut more of her acting teeth during the golden age of television on such classic series as DEATH VALLEY DAYS, 77 SUNSET STRIP and SURFSIDE 6, to name but a few. Hayes continued to perform on the stage in productions of such classics as of Come Blow Your Horn, Mary Mary, Oklahoma! and Same Time, Next Year. 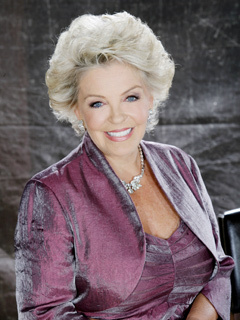 But Hayes is most famous as the indomitable Julie Olson Williams who has the unique distinction of having been, at one time, daytime’s youngest grandmother. It was on DAYS that she met her husband Bill Hayes in 1970. They married four years later, and the two remain a loving couple who occasionally perform on-stage together. They most frequently appear in productions of Love Letters. Hayes has been nominated for a Daytime Emmy three times (1975, 1976,1979). Her mother, the late actress/writer Elizabeth Harrower, changed daughter's name from Seabold to Seaforth, after the Seaforth Highlanders, a Scottish Highland regiment. Earned her B.A. in history at Los Angeles City College. Collects history books on the American West and Native American culture. With husband Bill Hayes, they were the first daytime actors ever to grace the cover of Time magazine in January 1976. Has lectured at Los Angeles Valley College and Boston University. Check Out This #TBT Interview With Susan Seaforth Hayes From 1990! Susan Seaforth Hayes marks 50 Years At DAYS Today!